For wholesale orders call (651) 462-2512. Toastie Mittens Pattern Plus - The best thing about these guys is that they actually FIT. They are toastie with the thick, warm sherpa lining doubled up with cotton batting. You add your finishing touches on the tops of the mittens for one of a kind pair every time. Piece the tops or make them whole-cloth. Your choice. 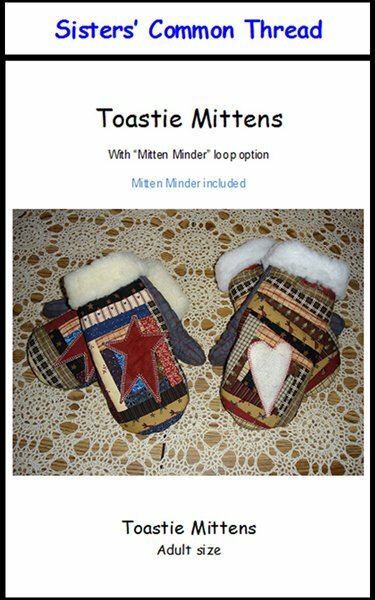 The pattern includes full size pattern pieces and comes with a unique "Mitten Minder" set which allows you to hook these oversized beauties onto your purse strap. To loose one would be a pity.